There are only a few college football head coaches who “move the needle” on a national basis. Nick Saban, Urban Meyer, Dabo Swinney. For the second time in four weeks, the Bulls will face another needle-mover. In the opener, it was P.J. Fleck at Minnesota. His over-top-enthusiasm and national ESPNU show make him a famous figure. Saturday night, it’s an even more famous coach coming to UB Stadium. Lane Kiffin is the most polarizing figure in college football. His short stints with the Raiders and Tennessee put him on the national map. His controversial hire and exit from USC added to that. His quiet-until-the-end stint at Alabama always made news. His hire at FAU just added to that. Since he’s been there, his willingness to bring in some controversial players and coaches has just moved the needle even more and added to the Kiffin Chronicles. So enjoy some high-profile focus on Buffalo this week. It’s not often a nationally-known coach comes to town. It should be fun, and entertaining. Bull Session Trivia: Kiffin (Oakland Raiders 2007-08) is just the second former NFL head coach to bring a college team to UB Stadium. Can you name the other? There was a focus by the coaching staff on getting the running game going against Colgate. It worked. Tyree Jackson, Johnathan Hawkins and Emmanuel Reed all had career-high totals. It also kept the game a little closer than it might have been, especially with the way the Bulls deep passing game was working. But getting it moving on the ground will pay big dividends for the rest of the season…Reed showed speed, quickness and an ability to race to the hole on his way to 120 yards rushing. At five-foot-six, he also has the ability to get lost among the lineman. Those skills always remind me of Branden Oliver, although I think Bo was a bit stronger and more of a tackle-breaker than Reed. Emmanuel says he’s flattered by the compliments to UB’s leading rusher…We saw a fullback for the first time. With his older brother Glynn hurt, Jake Molinich got the call and was an effective blocker…The draw play has become Tyree’s go-to play. No one has been able to stop it, and his running ability allows him to play off blocks and pick the right holes. The draw creates room for Tyree to do all of that, and that’s why makes it such an effective play…The pass he threw to Anthony Johnson for the 46 yard gain in the 2nd quarter was a thing of beauty. It was placed perfectly between the defender and receiver, and allowed Johnson to go up and grab it…Johnson has a catch of at least 46 yards in all three games…The Bulls offense has produced six plays of 45 yards or more. Last season, they had a total of five…Tyler Mabry’s 58-yard catch was the longest of those, and having a tight end who can get downfield, and get that open, is another huge sign for the offense…The Bulls used a heavy rotation on the offensive line. Evan Ksiezarczyk shared left tackle duties with Paul Nosworthy, while Jacquis Webb and Kayode Awosika rotated at right tackle. Skylar Hartley also played some at guard…Because FAU has played two run-heavy teams (Navy, Wisconsin), their defensive stats are skewed, much like UB. The Owls are 11th in the NCAA in passing yards allowed, but 124th in rushing defense. It’s hard to tell how good or bad they are at either. They do have three interceptions in the first three games, along with four sacks. But they are allowing 5.4 yards per rush…Linebacker Azeez Al-Shaair is their leader on defense. He tops Conference USA in tackles, and he’s totaled 207 the previous two years. He is questionable for this game with an undisclosed injury…Safety Jalen Young is another standout on the Owls defense. He had 14 tackles against the Badgers, and 100 last year…On the defensive line, Pitt transfer Jeremiah Taleni and Steven Leggett are the tackles who standout. 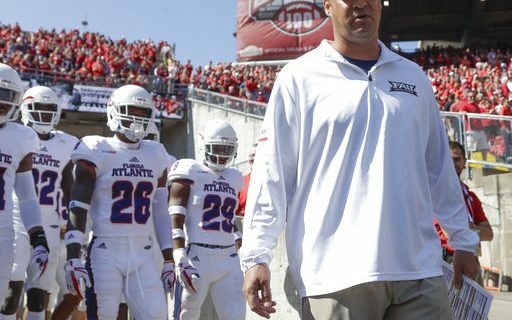 Kiffin has called the D-line his most improved unit…Last week’s shutout of Bethune-Cookman was FAU’s first in 11 years…Current UB player personnel director Roc Bellantoni was the FAU defensive coordinator the past three seasons. Much like FAU, the Bulls defensive stats are reflective of the teams they have played against. In three games, UB has faced only 63 passing attempts. Other than the 61-yard TD against Minnesota, the Bulls have allowed only two passes of more than 20 yards. They are #4 in the NCAA in pass defense. Overall, they rank 4th in the MAC in total defense…They finally got their first sacks of the season, and they came from unlikely places. Backup DT Chibueze Onwuka, a walk on player, had one. So did grad transfer Kennedy Emesibe, who came in from Cal. The Bulls have used a lot of players on the defensive line, sometimes going 10 deep…The large deficit in the Colgate game allowed two true freshmen to see the field. Safety Kobe Green had two tackles late. Linebacker Ja’Varius Harrison made two special teams tackles. Along with defensive end Malcolm Koonce, they are the three true freshman who have played this season…Khalil Hodge had “only” five tackles, but still ranks 4th in the NCAA and 1st in the MAC…Florida Atlantic had hoped that former Florida State quarterback De’Andre Johnson would be the starter. He’s been hurt, so Daniel Parr has started all three games. He’s very athletic, and a highly-touted recruit. Parr doesn’t run much, but does have 95 and 63-yard touchdown passes already…The backup is Jason Driskel, who threw for 385 yards against the Bulls in 2015…FAU has two outstanding running backs. Buddy Howell is coming off a career-high 175 yards last week. Devin Singletary ran for 109, and topped 1000 yards as a freshman last season…The Owls receiver group has been muddled due to some suspensions and injuries. Kamrin Solomon is the top wideout. He missed the first two game due to suspension. John Franklin is a former Auburn quarterback who transferred and made his first start last week. The leading receiver is Texas & JC transfer DeAndre McNeal. He’s averaging 24 yards per catch in three games…With Kendal Briles as the offensive coordinator, the Owls will run a Baylor-like offense. If you’re a fan of the outstanding Netflix documentary Last Chance U, you’ll see a lot of familiar names on the Owls roster. Three current FAU players, and one coach, are graduates of East Mississippi Community College, the junior college featured on the show. Starting WR John Franklin was the starting quarterback during the show’s first season in 2015. Injured Owls quarterback De’Andre Johnson was EMCC’s starting QB in 2016. Defensive end Tim Bonner was featured on the show last season. FAU’s tight ends coach Clint Trickett was on the EMCC staff for both seasons of the show. Another EMCC grad, Buffalo native Chad Kelly, will also be in town with his current team, the Denver Broncos. Bull Session Trivia Answer: Former Bears and Dolphins head coach Dave Wannstedt was the head coach of the Pittsburgh Panthers when they came to UB Stadium in 2009. Please join me, color analyst Scott Wilson, game host Brad Riter and postgame host Bob Gaughan for the broadcast on the Bulls Football Network. Our special two hour pregame show starts at 5:00pm. You can hear it in Buffalo on ESPN 1520 and in Rochester on Fox Sports 1280. A link to the online broadcast is also available here and on the Tune In app.